The stories of the infancy of John are apocryphal, but one in particular has inspired a very familiar image in art. I’ll start with a less familiar one. John the Baptist and the Massacre of the Innocents. Elizabeth, having heard that they were searching for John, took him and went up into the hill-country, and kept looking where to conceal him. And there was no place of concealment. And Elizabeth, groaning with a loud voice, says: O mountain of God, receive mother and child. And immediately the mountain was cleft, and received her. And a light shone about them, for an angel of the Lord was with them, watching over them. And Herod searched for John, and sent officers to Zacharias, saying: Where hast thou hid thy son? And he, answering, said to them: I am the servant of God in holy things, and I sit constantly in the temple of the Lord: I do not know where my son is. And the officers went away, and reported all these things to Herod. And Herod was enraged, and said: His son is destined to be king over Israel. Following this, Herod ordered the murder of Zacharias. But why did he say that John, rather than Jesus, was destined to be king? James does not clarify this. As far as I am aware, this story does not appear in western art at all: the only image I have found is on a pilgrim’s medallion, probably from Ein Karem. 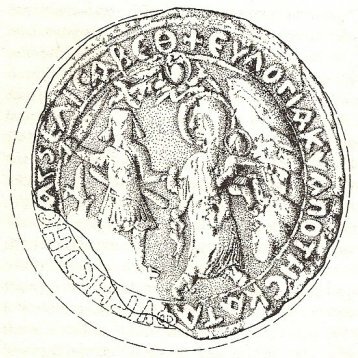 The medallion is in a poor state: this drawing of it makes what is happening clearer. 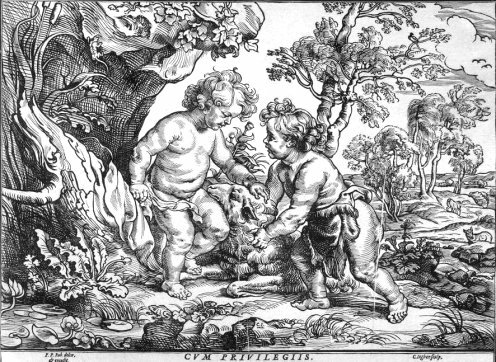 John the Baptist and the Infant Christ. One of the most familiar images in religious art is that of the Holy Family with the Infant St John. It is an attractive image, often serving a devotional purpose, but there is no mention of the encounter in the Bible. Might this have occured after the family's return from Egypt following the death of Herod, as mentioned in Matthew? This is the tradition. It is mentioned by Bonaventure in his Visions, but I have yet to locate the quote. These pictures vary in who is included. Mantegna's painting includes Mary and Joseph, and Elizabeth and Zaccarias. 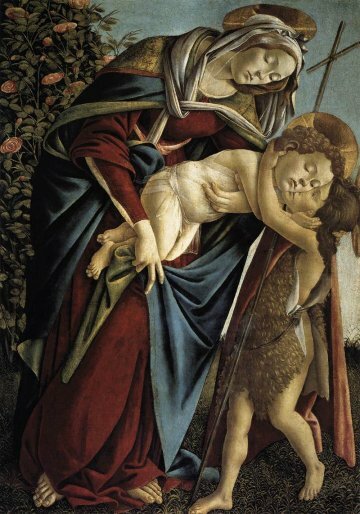 In the version by Botticelli Mary is the only adult. 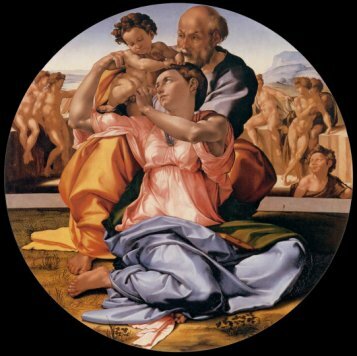 The Doni Tondo has a range of characters that have provoked much debate. Other versions include saints and angels. 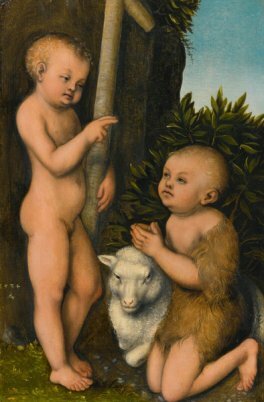 In the painting by Cranach, and the engraving by Christofell Jegher, Christ and John are alone; Cranach presents a solemn, devotional scene, while Jeher shows them having fun. This highly imaginative scene is by the nineteenth century German painter Julius Schnorr van Carolsfeld. 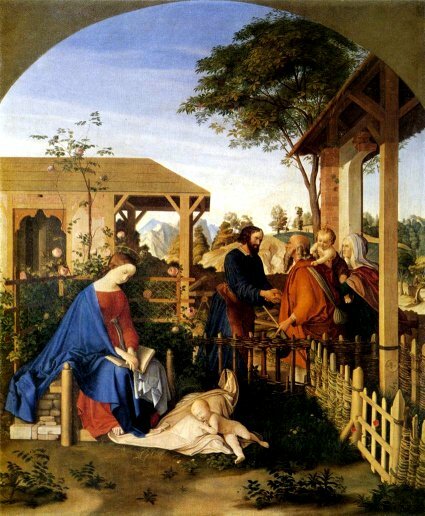 Here, John and his family have popped round to see the Holy Family at home. John the Baptist page 1 Home page - explore the site.